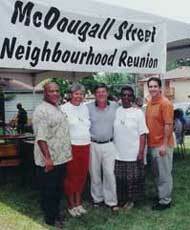 African Canadians have played a vital role in the development of Windsor and region. In the early 1800's they cleared land, established farms and businesses and forged a living in this area. Windsor and Essex County is home to a treasure trove of exciting and important historical information that tells the story of these first settlers and the many generations that followed. Along the way there are many great accomplishments and outstanding citizens to be celebrated and acknowledged. The African Canadian community is part of the very foundations of the culturally diverse city that is Windsor. It is a rich history which begins prior to Windsor's designation as a terminus on The Underground Railroad, prospers throughout the modern era and looks forward to an illustrious future. This is a living history that is being written as an active and dynamic community continues to meet struggles, overcome obstacles and builds upon the foundations laid by past generations. This site is currently undergoing some changes and development. Please bear with us as we experience some growing pains. We would like to encourage visitors to share information, suggestions or corrections at this time. Submissions can be made via e-mail to windsormosaicafricancanadian@gmail.com or on Facebook.